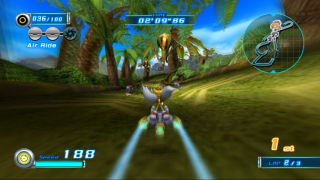 Botanical Kingdom is the second level in the Heroes story of Sonic Riders: Zero Gravity. Set inside the controlled climate of Monopole's vast, domed greenhouses, the level is dominated by super-sized tropical plants. Racers swing round dangling vines, power along vast, curving tree trunks, and the final section of the course even takes them through an immense beehive. Look out for dangling fruits; while Power type characters can knock them out of the way, everyone else is faced with bulbous roadblocks. Sonic has escaped with the meteorite, but now he must get to the bottom of things. Sonic and the others head to MeteorTech, who built the robots. After escaping Megalo Station, Sonic, Knuckles, and Tails are hiding in the vast greenhouses to evade the flying SCR-GPs. As luck would have it, Amy Rose has the same idea; she finds the trio concealed in the same shrubbery, and for the same reason; Amy has her own ring-shaped meteorite that the robots have gone crazy over. Sonic decides that they will have to investigate MeteorTech itself to get to the bottom of the mystery. Just then, Knuckles spots a squadron of robots tearing towards them along the greenhouse's thoroughfare. The heroes have to make a quick exit in front of the advancing machines! This page was last edited on 8 April 2018, at 08:44.